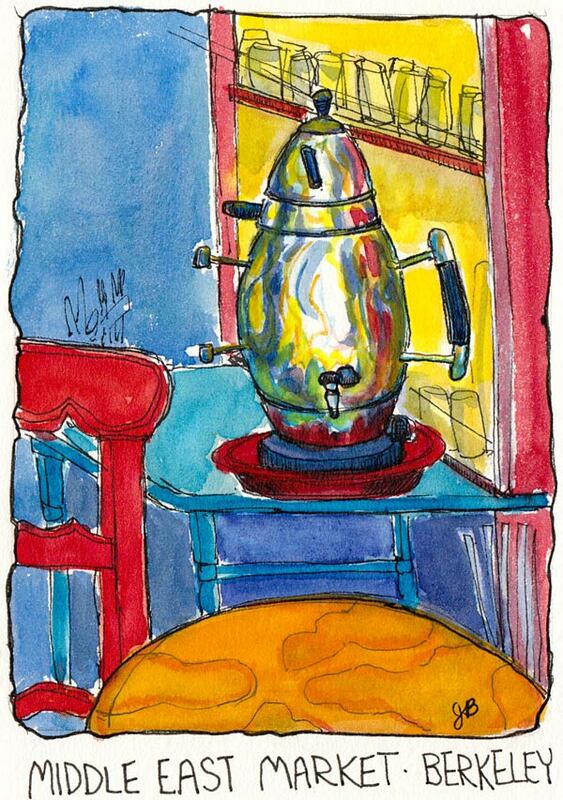 Middle East Market Teapot, Berkeley, ink & watercolor 5.5 x 7"
When I read this interesting story about the owner of the market, “From Ecuador via war-torn Iran to melting pot Berkeley” on Berkeleyside, I thought it would be a good place to sketch. I was right. It is bright and colorful with a large variety of Middle Eastern products and freshly made food. It was quiet there on a Tuesday evening so the gentleman manning the shop was fine with us sitting at the cafe tables in the back and roaming the shop to sketch. I got so drawn into the teapot that I only had time to do one sketch before they closed at 8:00. We usually sketch from 6:30 to 8:30 or 9:00 so it was a short evening. I love the bright colors here, especially in the…samovar? Whatever that shiny vessel is! Wonderful work! Just lovely, bright and exciting. Great picture. I love the bright colors and all the reflections in the tea pot!